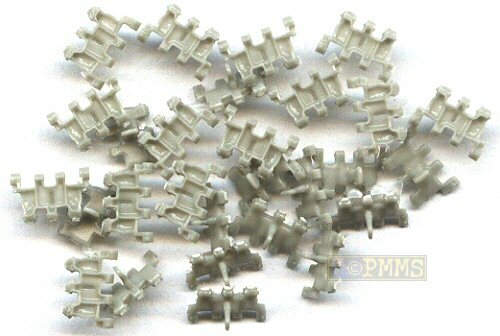 Master Club are a new manufacturer from Russia and have released a set of workable resin "snap-together" individual track-links for the BMD-1, BMD-2, BTR-D, Nona SPH and other BMD based vehicles. The links feature correct track pattern & thickness as well as the unique shaped track guide horns and are designed for any BMD kits from Eastern Express, Skif or Zvezda. The links are individually cast in light grey resin with just three small casting burs where the links have been pre-broken from the casting blocks to be cleaned up and a few links have some thin resin film to be removed but the cleanup is very quick and easy. The detail on the links is excellent with clean and well defined track face pattern and the correct size and shape of the unique inner guide tooth as well as nicely defined track end pins and for links that at only about 7mm x 5mm in size are very well done. 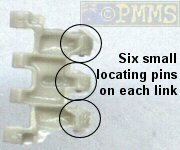 The links are designed to clip together and each link has six small locating pins on the three track hinge extensions with corresponding locating holes on the other side of the link. 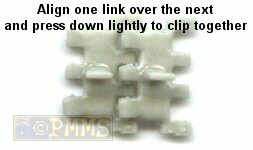 To fit the links together place one link on a flat surface and position the next link over the top and with light finger pressure simply press down to clip the two together, nothing could be easier. 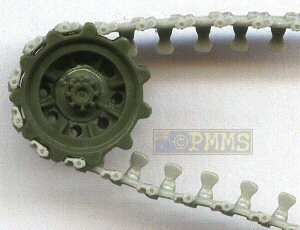 Due to the six locating pins they are smaller in size than the usual two pins in other snap together links which makes the assembly easier and also results in more robust track runs which did not tend to came apart with normal handling like some other sets and the full track run fitted perfectly without any modification around the Zvezda BMD (kit # 3577) drive sprockets use to test the links. A very well detailed workable track set with only minor cleanup needed and the simplest of assembly and compared to the other recent BMD track set from LionMarc Model Designs offers the better detail and easier assembly of the two sets.